With so much to see and do in Hendricks County, there is something for everyone. And the best part? We make it easy for you by planning and taking care of every detail of your itinerary. No two trips are exactly the same because we tailor your trip just for your group! The attractions we work with love welcoming visitors to their little corner of our county, and that personal touch is one reason we have so many repeat visitors. 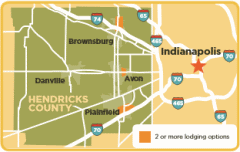 Our group-friendly hotels are conveniently located off I-70, I-74 and US Hwy 36.